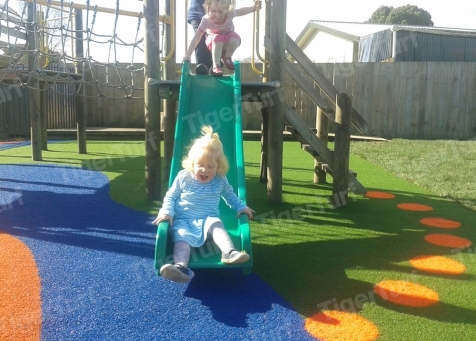 Tiger Turf New Zealand provides synthetic turf surfaces for lawns, commercial landscaping, sports grounds and school campuses, making it the ideal surface for the playground areas of Childcare Centres. TigerTurf have several playground systems that meet a range of different fall height requirements and have been tested to be fully compliant for absorbing impact up to 3 metres. Ensuring play safety is essential, both for the protection of the children using the equipment and to mitigate risk for the organisations in charge of these play areas. TigerTurf are certified by the Register of Play Inspectors International (RPII) to review the safety of a playground (fall zones, heights, free space, entrapments, etc) and provide solutions that make children’s safety the priority. Make sure you insist on genuine TigerTurf for your Childcare Centre. Contact us today.